Bill Hutchins of LKV Research was showing off his new baby, the Phono 2-SB ($2,500). This Swiss Army knife phonostage has pretty much everything you could want, including both balanced (40/50/59dB) and unbalanced inputs (34/44/53dB). Not enough gain? Call the factory and they'll customize it, adding another 3-6dB. Nice! Standard variable load impedance (from 50 ohms to 47k ohms) comes with really sweet output numbers (SE: 100 ohms output; Bal: 200 ohms output impedance). SNR numbers can get as high as 80dB and crosstalk of better than -90dB. For this price, these are really great stats. Bill was also showing with a prototype preamp (~$3,000, ETA in Q1 of 2014). The gain is is 6.5dB (SE) or 12.5dB (Bal), again, the specs are outstanding. JFETs feature highly in Bill's designs. And did I mention that Bill is just the nicest guy? 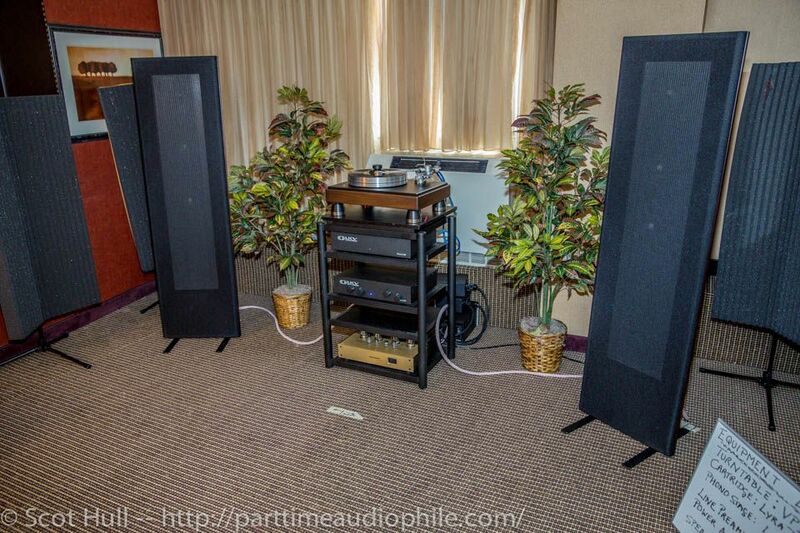 Shown here with a Conrad Johnson Premier Eleven amplifier and Magnepan 1.7 loudspeakers. When was the last time you saw those two together at an audio show? Ye gods! But despite all the pontificating on the Internet about how you need oodles of power to make any Maggie “come alive”, I am very happy to report that this is BS. The system also had a selection of cables from Cardas and Kimber. The Morph power cords came from Surreal Sound. The turntable was a VPI Classic 2 Special Edition and carried a Lyra Delos cartridge. Very transparent sound here, without bite or sterile edge. Lovely, all around. I think we’d all do well to keep an eye out for LKV Research. A damn fine outing.